This article on Global Rail News is entitled Study Finds C$1.7bn Undersea Rail Tunnel The Most Attractive Option For Labrador-Newfoundland Link. The article cites innovations in tunnel technology is one of the reasons, that this tunnel is now possible at an affordable cost. The study also proposed that the single rail tunnel, uses this operational method. They indicate because of low traffic levels, this would handle traffic for over forty years. Tunnel builders will increasingly get more ambitious and we’ll see more plans for tunnels in the future. My stockbroker and pension fund manager keeps contacting me about hydrogen power. There seems to be a lot of money chasing few good investments. What I find surprising is that two of the leading fuel cell companies are Canadian; Ballard and Hydrogenics, with one supplying Alstom with fuel cells for their hydrogen powered train. Bombardier at Derby, who are another Canadian company, have been very quiet on hydrogen. I believe that the control system on an Aventra looks at the train and determines what cars make up the train. Hitachi certainly do this with their A-trains like Class 800 trains and I suspect that the control systems of most modern trains can do it, as it allows trains to be lengthened and shortened as required. I believe that most electric multiple units have an electrical power bus that connects all cars to the electrical supply from the pantograph or third rail shoes. On a Btoitish Rail-era Class 319 train, which has DC traction motors, this is 750 VDC, but on modern trains, which generally have AC traction motors, it is probably something more appropriate. Bombardier are certainly going this route with the new Class 345 trains for Crossrail. I found this snippet on the Internet which gives the formation of the new Class 345 trains. So as both PMSO cars are there, I would assume that the current seven-car trains are two MSO cars or an MSO and a TSO car short of a full-train. The power cars/total cars ratio will be as follow. In The Formation Of A Class 707 Train, I showed that the ratio for Class 707 trains is just 0.40, whereas Greater Anglia’s siomilar five-car Class 720 train appears to have five cars with motors. Could this increase in the number of powered axles mean the following? Better acceleration for the same electrical power. More, but smaller and lighter traction motors. Less wheel-slip in some rail conditions. Each axle could be controlled individually, to minimise wheel-slip, which leads to extra maintenance costs. Smoother regenerative braking, as effectively every axle is braked without the use of inefficient friction brakes. If batteries are used for regenerative braking, then one smaller battery can be fitted to each car with motors. But the extra traction motors could cost more. Only Bombardier seem to have gone all the way. Perhaps, they have found that modern manufacturing methods can produce more affordable traction motors. One consequence of distributed power, is that each car will have a high electrical load, so there will be a need for a sophisticated electrical power bus going to every can on the train. I have ridden in the cab of a Class 43 locomotive. Admittedly, it was one that had been modified with a new diesel engine, I was surprised how quiet 2,250 hp can be, just a few feet away. Obviously, the sound-proofing was of the highest quality. 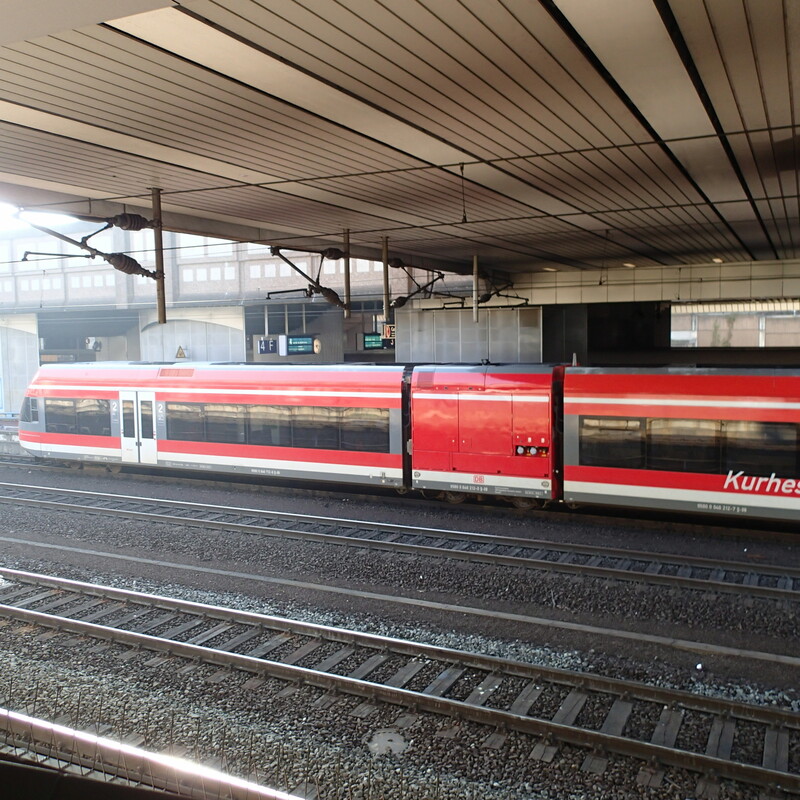 This picture shows a Stadler train, which has a diesel-powered car in the middle of the train. Greater Anglia’s new Class 755 trains will use this technique. Intriguingly, British Rail designed the record-braking Class 442 train, with all the electrical equipment and traction motors in the middle car of a five-car set. I suspect because of the design of an Aventra, Bombardier could put a diesel engine in one the middle cars to create a bi-mode Aventra. Bombardier have said in this article on Christian Wolmar’s web site, that they are working on a 125 mph bi-mode Aventra. In the Class 172 train, each car has a 360 kW diesel engine, so a five car 125 mph bi-mode train could need a substantial amount of power. In Alstom’s Coradia iLint, the hydrogen tanks and generators are mounted on the roof, thus taking advantage of the larger Continental loading gauge. Wikipedia says this about the train. The Coradia iLint is a version of the Coradia Lint 54 powered by a hydrogen fuel cell. Announced at InnoTrans 2016, the new model will be the world’s first production hydrogen-powered trainset. The Coradia iLint will be able to reach 140 kilometres per hour (87 mph) and travel 600–800 kilometres (370–500 mi) on a full tank of hydrogen. The first Coradia iLint is expected to enter service in December 2017 on the Buxtehude-Bremervörde-Bremerhaven-Cuxhaven line in Lower Saxony, Germany. In the UK, there isn’t the space, but I believe that a car could be built with a hydrogen tank and the appropriate size of hydrogen-powered electricity generator. Bear in mind, that a hydrogen power system will be is a lot quieter and vibrate less, that a diesel one. The Plug-and-Play nature of an Aventra or other modern trains, would mean that after the train software has been modified, it could detect that the train has a car with a hydrogen-powered electricity generator. The car would deliver its electricity, when it is require, through the electrical bus. The train’s computer system would control the generator, so that the level of power needed to move the train was available. Batteries are an integral part of Alstom’s Coradia iLint as this promotional video shows. I believe that Bombardier make extensive use of batteries in the Aventra for regenerative braking, running for short distances without electrification and electrification failure. Why Do I Think A Hydrogen-Powered High Speed Train Is Possible? By High Speed Train, I mean one that can travel at 200 kph or 125 mph. Most energy is needed to accelerate the train, not to maintain the high cruising speed. So if you take a train running along a line with only a few stops, that is fairly level with no long climbs, there will be a minimal power requirement, except where accelerating from a stop. Energy requirement can be reduced by the following. Design the line as straight as possible. Remove as many gradients as possible. Have separate tracks for stopping and high-speed traffic. Install a modern signalling system, so that trains run efficiently. Have a very efficient train with low rolling resistance and good aerodynamics. Have as few stops as possible. Network Rail seem to be improving the tracks all over the UK to this standard and Point 6 is satisfied by modern trains like Aventras. Point 7 depends on getting the timetable right. Adding all these factors together and you can see why I believe a hydrogen-powered High Speed Train is a possibility. The great advantage of developing a hydrogen-powered train, is that a lot of the initial testing can be done in a lab, as all you need to develop is a power module, that can fit in the train, that can generate the required number of kilowatts. Independently, the train company would need to develop an electric train capable of 125 mph running. Hydrogen-powered High Speed Trains could run on several lines in the UK. The Midland Main Line is the obvious line for a hydrogen-powered High Speed Train. A lot of the route is already capable of 125 mph running. The Southern section from Bedford to St. Pancras is electrified, so hydrogen power would only be needed North of Bedford. The new East Midlands Franchise will streamline the intermediate stops. Parts of the line go through the World Heritage Site of the Derwent Valley and would be difficult to electrify. Quiet hydrogen-powered trains would be acceptable to all. Selective electrification could be applied at Derby, Leicester, Nottingham and Sheffield, to charge batteries and accelerate trains. There is a lot of work going on =North of Bedford as far as Kettering and Corby. The Corby branch is being made double track. Bedford to Glendon Junction, where trains to Corby leave the Midland Main Line, will become four tracks. Tracks will be electrified to Kettering and Corby. 125 mph running will be possible as far as Glendon Junction and Corby. Will the two fast lines be electrified between Kettering and Glendon Junction? This would enable trains going North from Kettering to accelerate to 125 mph using the electrification, rather than hydrogen or battery power. The electrification would catapult them the nearly thirty miles to Leicester at 125 mph, with speed maintained by using small amounts of hydrogen or battery power. Coming South, the train would get to 125 mph leaving Leicester, either using a short length of electrification through the station or by use of the onboard power. Small amounts of hydrogen or battery power would keep the train at 125 mph, until it could connect to the electrification at Glendon Junction. I’m assuming that the signalling can keep the fast lines free of slow traffic. But even if they are slowed by a crossing train, regenerative braking using the battery will enable speed to be recovered quickly. This article on Rail Technology Magazine is entitled DfT Deal Means East Midlands HS2 Station Could Open Early. East Midlands Hub station would obviously be electrified for HS2 services from Birmingham and London. So perhaps a few miles of electrification could be added to the Midland Main Line to get trains to operating speed, after a stop at the station. In addition, could selective electrification be applied at other stations like Derby, East Midlands Parkway, Leicester, Nottingham and Sheffield. It could be a bit like a game of 125 mph Pass-the-Parcel. Trains could be at 125 mph for most of the way from St. Pancras to Sheffield, giving a journey time somewhere in the region of ninety minutes. I’ve never travelled on the North Wales Coast Line. It is around ninety miles long. As it’s a coastal line, I suspect that the route is fairly level. No-one would complain about the noise reduction of a hydrogen-powered train. Virgin’s Class 221 trains take about a hundred minutes from Holyhead to Chester with six stops. It is a route, where a bi-mode train could probably save some minutes, as they could use the electrification South of Crewe. Alstom have already set up a base in Widnes and are interested in demonstrating hydrogen trains between Chester and Liverpool via the Halton Curve when it reopens. But a train with a slightly better performance to the Coradia iLint could be ideal for Liverpool to Chester and along the North Wales Coast. The West Of England Line goes from Waterloo to Exeter and has the following characteristics. The Waterloo to Basingstoke section is forty-eight miles long and electrified. The Basingstoke to Exeter section is 124 miles long and not-electrified. The route is fairly level. The operating speed is 90 mph. The route is served by 90 mph Class 159 trains. This is one of those lines, where a bi-mode train would be ideal. The route might be suitable for a hydrogen-powered train. Between Ashford and Southampton, there is only one section that is not electrified and that is the Marshlink Line, which is just 26 miles long. I suspect there are other routes, but I do think gentle lines without too many gradients are probably the best lines for hydrogen-powered trains. As Hitachi’s IEP and Stadler Flirts have similar electrical layouts and design, a similar technique involving hydrogen poower could probably be used. Liverpool is proud of its maritime heritage and the Pier Head on the Mersey is part of a UNESCO World Heritage Site called the Liverpool Maritime Mercantile City. When Celia and I met in Liverpool in the 1960s, it was a simpler place, where we would walk to take the ferry across the Mersey. These pictures show the Pier Head today. I’d never realised that the road across the Pier Head, had been named Canada Boulevard in honour of Canadians, who lost their lives in the Battle of the Atlantic or the war against German U-boats. Shown in the pictures is the memorial to Captain Johnnie Walker, one of the leading British commanders in the battle. The scale of the battle is shown by the fact that according to Wikipedia the Allies lost over 70,000 sailors, 3,500 merchant ships and 175 warships, whereas the Germans lost 30,000 sailors and 783 submarines. One thing that wasn’t there in the 1960s is the canal that links the Leeds and Liverpool Canal to the Stanley Dock, so narrow-boats can visit the city centre. I woke early, so got up and made a cup of tea and did a bit of writing, whilst listening to the excellent Doton Adebayo on Radio 5. At one point he was talking to a Canadian journalist, who said that due to cutbacks, the Commonwealth Games are not being shown on Canadian television. All they are getting is the odd highlights. I have some sympathy for the Canadians about this story on the BBC, as I can’t stand the stuff. C, on the other hand, was an addict, and I miss taking her, her morning cup of hot Marmite every day. Is this discrimination against the British, as there is nothing in the article about banning the similar product from Australia; Vegemite? But according to Wikipedia, Vegemite is also banned. This report about the opening of Kings Cross Square appeared in The Province. But then George Vancouver would these days take a train from Kings Cross to get to his birthplace at Kings Lynn. Lyse Doucet is one of my favourite broadcasters and in some ways a bit of a hero, as she seems so unfazed of all the horrors she has faced, just being the total professional. Like many I suppose, I’d always assumed she was from Quebec, due to her French name and her accent. But she is actually an Acadian, a group, who I knew little of until I looked Lyse up last night. Wikipedia says this. Although today most of the Acadians and Québécois are French speaking (francophone) Canadians, Acadia was a distinct colony of New France, and was geographically and administratively separate from the French colony of Canada (modern day Quebec), which led to Acadians and Québécois developing two rather distinct histories and cultures. I first became aware of Lyse, when she was reporting from Iran. In one report for From Our Own Correspondent, she described how the Russian Ambassador at a news conference, had started chatting her up, and was totally surprised, when he found the lady in the burkha was Canadian. I do find it strange that two of my heroes are called Lyse or Lise. The other is of course Lise Meitner. This product got a plug on Have I Got News For You, tonight. I thought it was a spoof, but if it is, the web site is a masterpiece of misleading information. It is actually a gluten-free breakfast cereal. The product page is here and I only have one problem with it and that is that it contains cranberries, which are a no-no if you are on Warfarin. My other problem might be putting on a lumberjack shirt and high heels to eat it. There is a big row going on in Quebec about the use of the proper language in an Italian restaurant. It’s here in the Guardian. This paragraph shows the pedantic nature of the language police. After a five-month investigation into an anonymous complaint, Massimo Lecas received a letter from the board telling him that his establishment, Buonanotte, had broken the law by including the words “pasta” on the menu and “bottiglia”, the Italian word for bottle, instead of the French word bouteille. It sounds like several Italian restaurants, I have been to in the UK, the Netherlands or France. I have only been to Quebec once and wouldn’t go again. I don’t speak French well, but I can read it pretty well, as I’ve spent a couple of summers in the South of France and have also read some of the James Bond books in French. But I found the French in Montreal very difficult and I never worked out how to use the public transport, as there is no English translation. It was almost like going to Wales and finding everything in Welsh. Even Paris, which last time I looked at the map was in France, is a city, where instructions for public transport are in multiple languages and in that respect it is much better than London. But the main reason, I won’t go, is that I found on that trip it was difficult to stay gluten-free. In fact, I got glutened for the only time in recent years. It was mainly because the good restaurant I ate in, had probably used oven-chips, which are coated in wheat to make them crisp. Some years ago, I used to own a hand tool company. We sold in numerous countries including the United States and France, and then had an enquiry from a distributor in Canada. They would take the product, but the product leaflet would have to be in perfect Canadian French. French just wouldn’t do! So at some expense we got a French Canadian translation and the product was duly launched in Canada. Some time later, we had an urgent order from France and sadly we were out of French leaflets, so we told them, we did have the French Canadian version in stock. So we faxed one to France and the French said that the leaflet was rather quaint and a good laugh, but that it would do to fulfil the urgent order. There’s no doubt that French Canadians are much more bothered about their language than the French. Perhaps though some Canadians are also a bit touchy about English spelling. I once flew to the States sitting next to a secretary at the New Zealand High Commission in Toronto. She had to be very careful she didn’t use American spelling, when writing to some English-speaking Canadians, as otherwise they’d return it with corrections. What Food Lover Would Smuggle American Cheese? I like cheese and especially a nice good blue one, but why anybody would want to smuggle American cheese, I really don’t know? I suppose it could be a taste crime, like the sort of clothes beloved of golfers. One question the article provokes in my mind, is does North America have designer cheese-makers? After all why not, as we had none thirty years ago and now they are everywhere.